After months of camping out in the center of Hong Kong demanding genuine democratic elections, Occupy Central protesters were evicted from their sit-ins by Hong Kong police in late 2014. But in the shopping district of Mong Kok, protesters didn't give up so easily. Thousands took to strolling through the normally congested area in a peaceful “shopping” protest. Police tried to clamp down on the tactic by arresting participants, something Occupy Central is certainly no stranger to – 955 protesters and protest supporters were arrested throughout the movement. Human rights activists worried that officers were targeting minors, who are more vulnerable to threats and may not be aware of their legal rights, for arrested. Over the weekend of December 13 and 14, 2014, 14 teenagers were taken into custody. Occupying protesters had earlier withstood violent police efforts to clear their camps using tear gas and pepper spray with the help of umbrellas, leading some international media outlets to dub the movement the “umbrella revolution.” The movement was also the target of political pressure and intimidation from Hong Kong and mainland Chinese authorities. The pro-democracy movement in Hong Kong had slowly and surely prepared for the sit-in for months in case their previous calls for free elections fell on deaf ears. Beijing has promised Hong Kong, a special administrative region of China, a direct vote for the first time in the 2017 election of its top leader, but hobbled the democratic development with a requirement that all candidates get majority support from a nominating committee stacked with pro-Beijing members before being allowed on the ballot. Mainland officials officially handed down that decision at the end of August 2014. But even before China's framework for Hong Kong's election reform was announced, Beijing insisted that “love of country” was a requirement of a Hong Kong chief executive and a nominating committee should be part of the process, to the alarm of many Hong Kongers. Former British colony Hong Kong is supposed to enjoy a high level of autonomy from the communist mainland under the “one country, two systems” principle, but a white paper released by the Beijing government in June 2014 seemed to imply Chinese officials have a loose interpretation of what that autonomy means. The group behind the sit-in, Occupy Central with Love and Peace, organized an unofficial referendum early in the summer of 2014 to gather citizen opinion on the matter. Nearly 800,000 people signed the referendum, which included three different elections scenarios — all three allowing the people to choose the candidates. On July 1, 2014, the anniversary of the handover of Hong Kong to China in 1997, half a million people marched through Hong Kong. The day has become one that traditionally sees protest for universal suffrage, democracy and autonomy from China. Occupy Central held a peaceful rehearsal sit-in later that day, at the end of which more than 500 people were arrested, with police accusing them of participating in an illegal assembly and obstructing police officers from performing their duty. Student activist groups launched a class boycott in late September of that year to continue the fight for a democratic chief executive election and build momentum for Occupy Central's sit-in, which was expected to take place around China's National Day on October 1. 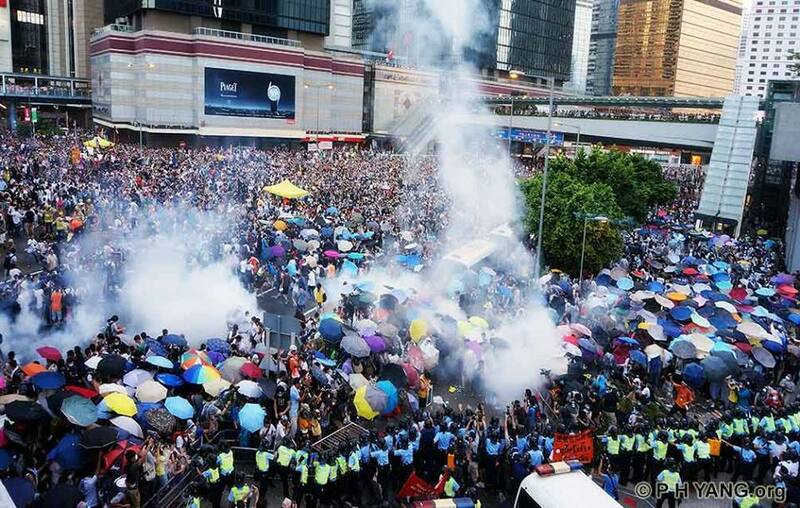 Thousands gathered in central Hong Kong, and violent clashes broke out in spots on September 27. Occupy Central kickstarted their planned sit-in the following day, and participants soon faced police batons, tear gas and pepper spray as they held their ground. Pro-government camps tried to match the pro-democracy mobilization, without significant success. Beijing's government, meanwhile, touted the nominating committee as a novel solution to maintain Chinese-style democracy. But the issue is more serious than a simple public relations battle. Mainland officials have said vetting Hong Kong candidates on their support for the Chinese Communist Party is a matter of national security, and some in Hong Kong fear continued pro-democracy protests could lead to violent military intervention from Beijing, like what happened during the 1989 Tiananmen Square demonstrations, when at least hundreds were killed in a bloody crackdown. The pressure on those who speak out is growing. One popular pro-democracy news site, The House News, shut down on July 26, 2014; the founder said he was “terrified” by the political atmosphere in Hong Kong. Pro-democracy protesters believe their future is at stake, and so does the Chinese government. The fight is far from over.